In context: Boston Dynamics has demonstrated quadruped robots that can open doors and navigate stairs. Other than showing us that they can systematically find and kill us no matter where we hide, they don’t seem all that useful. All joking aside, rival robotics firm ANYbotics has proven that robotic dogs can be commercially viable. 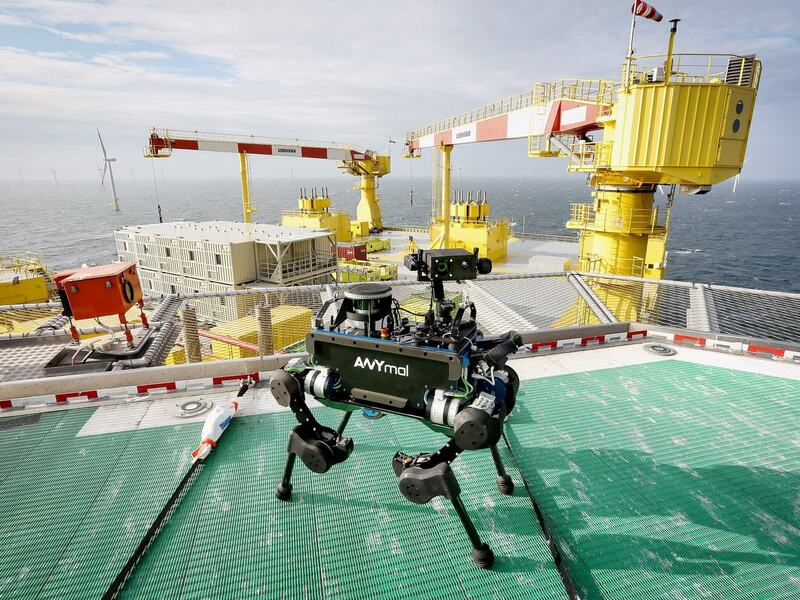 A pilot program located on an offshore energy platform in the North Sea has one of the firm's quadrupeds patrolling the facility performing inspections, IEEE Spectrum reports. The robot is called ANYmal. Back in March, we reported on its ability to dance to any music using self-analysis algorithms. Now the autonomous bot has become the “world’s first [energy] transmission systems” inspector. It is being tested on the world’s largest offshore converter platform operated by TenneT. The facility is very remote but still requires a human to come along to check gauges, meters, switches, and other equipment. It is a tedious job that nobody wants to do, and thus, is perfect for a robot. You can see how mundane and boring the job is in the above video showing ANYmal at work — a lot of long hallways and routine checks. Inspections also require a human to do a lot of stooping and squeezing into tight places, something for which a robot is well-suited. The quadruped design has advantages over other modes of locomotion. For example, a bot with wheels or tracks would have a hard time navigating the many obstacles encountered in the facility. ANYmal, on the contrary, can simply step over obstacles like pipes and conduits. The robot is not without its limitations. Some of the gauges are a bit too high for it to check. It also cannot open doors or cabinets, so these have to be left open for it. However, these constraints can be overcome with upgrades to the bot. An extendable neck would allow ANYmal to reach those higher meters and Boston Dynamics already demoed how the SpotMini can open doors with an arm-like appendage on its back. The only real disadvantage having ANYmal do the inspections versus a human is if it does encounter a problem with equipment, it will not be able to fix it. Humans will still be required for repairs, but at least they will have a robot that can tell them what needs servicing rather than going through the whole facility themselves.